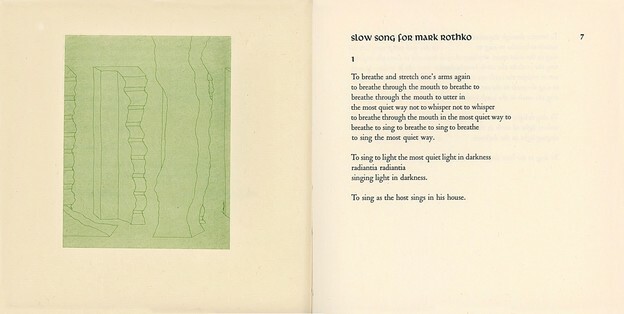 Taggart’s “Slow Song for Mark Rothko” from ‘Peace on Earth’ (Turtle Island, 1981). Reading the poetry of John Taggart involves the pleasures of repetition, as well as the mysteries and agitations of repeated presences: of language, of ideas, of sound forms, of song. To open a book of Taggart’s poetry is to invite a round of singing and a round of thinking about what the poem does when it is sounded out, what elements of thought it welcomes in. A retrospective consideration of his work must necessarily involve the recognition that repetition is what rings the changes in the poems and what signals those changes themselves that the poems enable. Repetition can be used as a compass to guide you through Taggart’s poetry; it’s a tool, an orienting device. But it also works as a major theme in the poetry; as such, more than a tool, it’s a current, a form of fluidity and a generator of sustaining power for the work itself, figuring the musical practices that Taggart works and reworks in his poetry. Repetition embraces compulsion as much as it enacts transformation. Where it is a technique it can also be a symptom — symptomatic of a pathology or indicative of an effort to surpass the compulsion to repeat, a sign or token to make something new. (Symptom from syn, together, and piptein, to fall.) In one of his essays on analytical technique, “Remembering, Repeating, and Working-Through,” Freud considers the relationship between repetition and the “motive for remembering,” suggesting that as these forces are transferred, during analysis, they become “harmless, and indeed useful,” by giving them the right to be asserted “in a definite field.” He calls this field a “playground,” in which the compulsion to repeat is “allowed to expand in almost complete freedom and in which it is expected to display to us everything … that is hidden in the … mind.” Freud recognized that repetitions in his patients were combinations of repressed memories and a resistance to remember them. Rather than curbing these repetitions, he sought to transform them in the “harmless” space of analysis. Kierkegaard juxtaposed repetition with recollection. He claimed that the Greeks “taught that all knowing is a recollecting” but that “modern philosophy will teach that all life is a repetition.” The difference between repetition and recollection, in Kierkegaard’s mind, was neither a matter of degree nor of kind, but of direction. “Repetition and recollection are the same movement, except in opposite directions, for what is recollected has been, is repeated backward, whereas genuine repetition is recollected forward.” Repetition, because it moves forward, has the possibility of making a person happy, whereas recollection makes him unhappy. If there is a credo to Taggart’s work, it’s move forward. In the brief introductory remarks to a rare poetry reading in 2001 at the occasion of Taggart’s retirement from teaching, Pam Rehm, who had been one of Taggart’s students at Shippensburg University, said, “John always taught me that the important thing is to move forward. So that’s what I’m going to do.” At which point, she started her reading. Expanding into a defined field of almost complete freedom and moving forward: these are the creative results of repetition. that thing must be that same thing went all over him. Much as the Taggart line starts from certain words the poet fixates on — precious, epiphany, saint, want — to develop from a line into a stanza into a progression, the effect is experienced not as fixation (or as a compulsion to repeat) but as cantillation, in which the struck bells of the words and phrases resound as other bells of words ring out, in rhythmical, repeated sequences that drift into harmony, but then unsettle into slight dissonance. 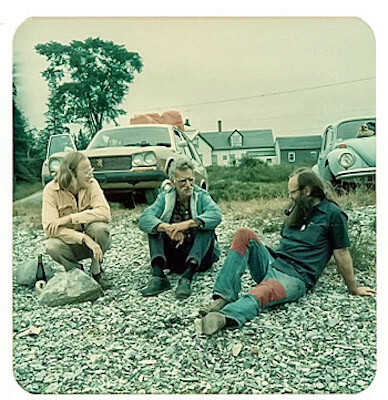 John Taggart, George Oppen, and Ted Enslin: Taggart notes, “this was 1975 at Sylvester’s Cove, Maine. We had been visiting Ted at his place in Temple (Maine — Denise and Mitch Goodman lived not far away) and agreed to meet with George and Mary for a picnic. They sailed over from their summer place at Little Deer Isle” (photo by Jennifer Taggart). To suggest there is only one Taggart line, however, would be misleading. I think Taggart’s work can usefully be organized into three major periods, albeit ones with intermediate periods that incorporate elements from previous periods into the next. Taggart’s early poetry is characterized as Objectivist experiment, to put it one way. Objectivist writing, which is probably the single most important influence on Taggart’s work, is a label applied to a group of second-generation Modernists who began to work in the 1930s but whose major works tended to be produced in the 1960s, including Louis Zukofsky, George Oppen, Lorine Niedecker, and, to a lesser degree, Basil Bunting, whose work emphasized the treatment of the poem as an object, and whose most significant predecessors were William Carlos Williams and Ezra Pound. Taggart’s poetry in an identifiably Objectivist mode encompasses a decade of work, beginning with To Construct a Clock, which appeared in 1971 when the poet was twenty-nine years old, through The Pyramid Is a Pure Crystal, The Prism and the Pine Twig, into Dodeka, which was published in 1979. 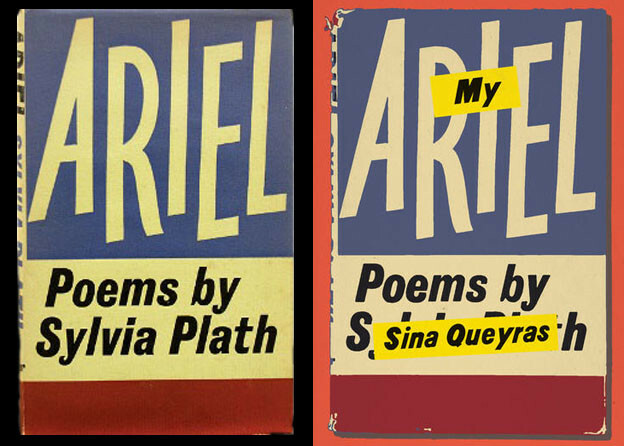 Two of these books, To Construct a Clock and The Prism and the Pine Twig, include shorter lyric poems that reflect Taggart’s investment in the work of George Oppen. Both Pyramid and Dodeka are more distinctly informed by a craft inspired by Louis Zukofsky, in that the books — each made up of one single serial poem apiece — involve complex compositional systems that place considerable demands — and stress — on the poems themselves. Peace on Earth, from 1981, as I’ve already indicated, is a turning point. This book, comprised of four poems, signaled a seemingly enormous change in Taggart’s work. Gone were the short, Objectivist lyrics. Gone too were the complex systems, and the constraining boxes around the poems. Here were poems that breathed and stretched their arms, even as they took on grave subjects, such as the cost and aftermath of the Vietnam War explored in the title poem. The mode that Taggart discovered at this time directed his work for the next fifteen years, culminating in the publication of Loop in 1991. 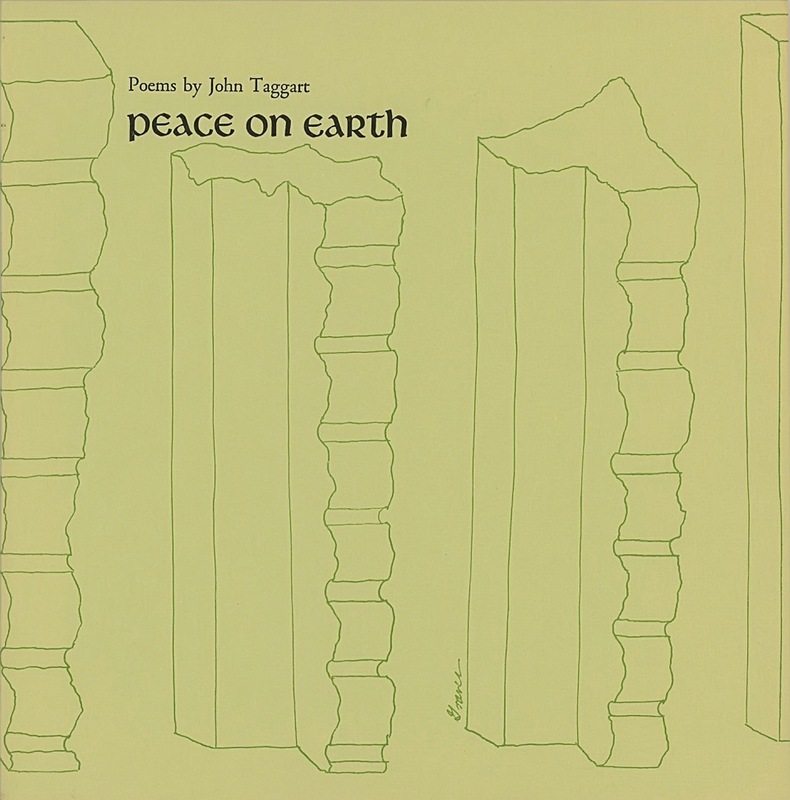 This is a massive book of poetry — over 230 pages — that gathers most of Taggart’s work from the 1980s, including one of his most memorable works, “The Rothko Chapel Poem.” He continued to explore this opened line in two subsequent books, Standing Wave and Crosses, the latter of which, despite being recently published (2005), contains work from the early to mid-1990s. If Taggart’s first period were to be labeled Objectivist experiment, this second period might profitably be called minimalist incantation. I first heard Taggart read his poetry in the early nineties; the effect of listening to his poems spoken aloud was to understand the mesmerizing, hypnagogic modality at work in these compositions. A splendid little poem. Its lyric surprise relies on the unwinding of the syntax to the last line, which repeats the key word, “rain,” the sound of which in the mind mimics the actuality of the dry leaves clattering in the morning or evening breezes. The poem begins to expand syntactically and imagistically in the fourth line, “when the ear’s not yet adulterated/unadulterated,” aided by the absence of punctuation, such that the phrases connect and compound. (Minimal use of punctuation is a trait consistent throughout Taggart’s work.) The pairing of adulterated/unadulterated is important to the poem: initially, it suggests sexual corruption (or its lack) and by extension, the sense of being tainted/untainted. But it’s also a botanical word, used to describe hybrids and pure breeds in flower growing, for instance. The ear not yet stained by the day or tuned to the sensitivities of the day, moving forward into the day, at first hears rain. The genuine repetition in this poem is not only the word “rain” but the idea of its sound carried through the whole. Niobe lost all her children. Niobe was the wife of the Theban king Amphion, mother of seven sons and seven daughters. So proud she was of her children that one day she was boasting to Leto, daughter of Titans and mother merely to twins but sired by Zeus: Apollo and Artemis. Robert Graves sets the vivid scene: “Mante, the prophetic daughter of Teiresias, overhearing this rash remark, advised the Theban women to placate Leto and her children at once: burning frankincense and wreathing their hair with laurel branches. When the scent of incense was already floating in the air, Niobe appeared, followed by a throng of attendants and dressed in a splendid Phrygian robe, her long hair flowing loose. She interrupted the sacrifice and furiously asked why Leto, a woman of obscure parentage, with a mannish daughter and a womanish son, should be preferred to her, Niobe, grandchild of Zeus and Atlas, the dread of the Phrygians, and a queen of Cadmus’s royal house? Though fate or ill-luck might carry off two or three of her children, would she not still remain the richer?” Leto was not placated. Before Niobe could do anything about it, her superior twins, armed with bows, were seeking and destroying Niobe’s children, slaying them all. In her grief, Niobe wept until she was turned into a column of stone. Taggart’s poem works together into a gloss the myth of Niobe, the mystery of Sainte-Columbe’s music, and the fact of trees, whose anthropomorphism in his poem casts them as Ovidian actors in his own transformation of music into an inward summons. Besides sound repetitions, Taggart avails mythic, thematic repetitions: Niobe’s loss anticipates Sainte Columbe’s melancholic music anticipates the death of Taggart’s friend, Bradford Graves, anticipates his recollection of that loss in this little poem. The repetitions and prolongations in the line, “fine clockwork of it subtle grammar of it of its words,” demonstrate a poetic gesture typical of Taggart’s work: preserving the structure of a phrase to push a thought forward, always slightly altered and adjusted. Much like some of the gestures of classic-period minimalist music. Creeley’s poem, “A Song,” from For Love, which Taggart’s poem deliberately echoes, is both a provocation and a summons, both especially potent for a susceptible young poet to receive. thrush, though I have never seen one. and so, at peace, so very much now this same quiet. it is no longer important. With great tenderness and unabashed grief, the older poet looks back on the image of the younger poet he was, sitting by the side of the river, and remembers being provoked and summoned by Creeley’s poem. The potential for bathos in such a poem is great unless handled with honesty and care. “[H]ear me now all these years later,” he says. “[R]eading with older/different eyes / which see what they see through/after tears the locked the unacknowledged.” Unacknowledged is the grace received at that moment from Creeley’s poem about “a girl so bright/in bloom who rejoices the heart.” The poet’s death and the memory of this moment trigger in Taggart a “motive for remembering” (to use Freud’s phrase again) that allows him to work through his grief. The conclusion to the poem is a highlight in Taggart’s oeuvre. Taggart is one of the most important innovators in American poetry in the past fifty years, the author, in the words of Robert Duncan, “of the larger dream-song of a transmission that goes back surely to Herakleitos and Pythagoras,” carrying forward into the present “a received content of our poetic imperative.” His poems define my sense of experimentation and revelation in a life devoted to poetry, poems that incant, in compulsive repetitions expanding into freedom, the dimensions of a definite field, a playground of language, wherein we might discover, if not everything, at least many of the things that lay hidden in the mind. 1. Sigmund Freud, “Remembering, Repeating, and Working-Through,” in The Standard Edition of the Complete Psychological Works of Sigmund Freud XII, trans. James Strachey (London: Hogarth Press, 1958), 154. 2. Søren Kierkegaard, Fear and Trembling/Repetition, trans. Howard V. Hong and Edna H. Hong (Princeton: Princeton University Press, 1983), 131. 3. At Shippensburg University, Shippensburg, Pennsylvania, April 7, 2001. 4. John Taggart, “A Preface,” in Songs of Degrees: Essays on Contemporary Poetry and Poetics (Tuscaloosa: University of Alabama Press), 71–72. 5. Taggart, Is Music: Selected Poems, ed. Peter O’Leary (Port Townsend: Copper Canyon Press, 2010), 35. 6. Taggart, Songs of Degrees, 72. 7. 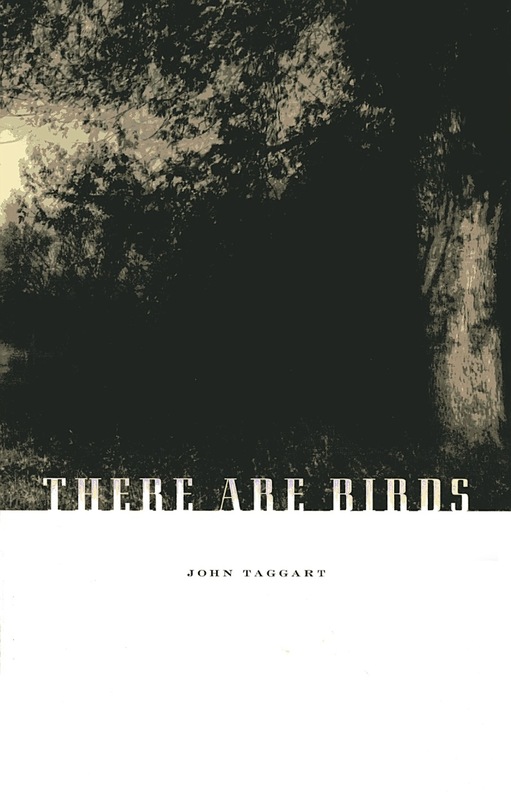 Taggart, There Are Birds (Chicago: Flood Editions, 2008), 23. 8. Taggart, Is Music, 203. 11. 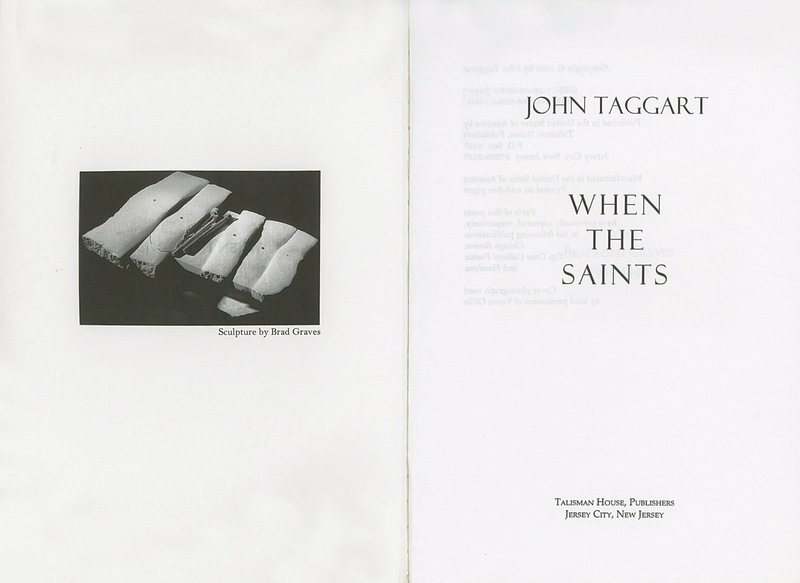 Taggart, When the Saints (Jersey City, NJ: Talisman House, 1999), 24. 12. Robert Graves, The Greek Myths: 1 (New York: Penguin, 1960), 258–9. 13. Taggart, Is Music, 256. 14. Ibid., 309; note the lineation quoted reproduces the text in There Are Birds, 83–4. The text in the Copper Canyon edition is inaccurate. 15. Robert Creeley, The Collected Poems 1945–1975 (Berkeley: University of California Press, 1982), 112. 16. Taggart, Is Music, 310. 19. Robert Duncan, “Introduction,” in Dodeka (Milwaukee: Membrane Press, 1979), v.